Nelson Sanchez was just a baby when he was diagnosed with sickle cell disease, and his mother was devastated – the disease causes constant pain and a shortened life expectancy. As a teen he felt he had no future and no hope due to the limitations caused by the pain of sickle cell crises. During a crisis, cells block the blood stream causing excruciating pain and damage to the organs and tissues. New developments in bone marrow and stem cell transplantation now offer the hope of a cure and a healthy life to sickle cell patients. “When I learned that a bone marrow transplant could cure my condition, I felt like Pinocchio learning that his wish could come true and he could become a real boy,” said Nelson. But there were no matches in his family, and his mother was heartbroken that she couldn’t be the one to cure him. Nelson remained positive that someone in the world was his matching donor, and after a search of several months, his doctors at The Children’s Hospital at Montefiore in the Bronx found her in Gift of Life’s registry. Becky Lyle-Sulkin, 30, joined Gift of Life’s registry in September 2013 as she and her mother were leaving the High Holy Day services at a congregation in her hometown of St. Louis. Rebecca had previously served as a counselor at Camp Rainbow in Chesterfield, Mo., a camp for children with blood cancer and other blood disorders. One of her campers had died of complications from a blood disorder, so when she saw the Gift of Life swabbing table, she joined in his memory. “When I learned that a bone marrow transplant could cure my condition, I felt like Pinocchio learning that his wish could come true and he could become a real boy,” said Nelson. Now a resident of St. Paul, Minn., she was thrilled to be called as a donor, especially for a 16-year-old boy. Her mother accompanied her to the collection center at Georgetown University Hospital, and her twin sister flew in from Chicago to surprise her. In September 2016, Nelson received his bone marrow transplant and began his recovery. He found that having to live in an isolation room for an extended period was difficult at times, but his family gave him incredible support. “My mother and stepfather came to visit me every day and stayed with me until visiting hours were over,” he said. As his health improved, he wanted very much to meet the person who had given him the chance to live a normal life. That opportunity came earlier this year, when Nelson was invited to meet his donor at a private event held in Aventura, Fla., at the home of Gift of Life supporters Patty and Nick Wexler. Before an intimate group of guests, Patty welcomed Nelson and shared his story, then after three years of waiting, he and Becky met for the first time. Their emotional embrace and incredible smiles show the instant connection they felt. To watch the Facebook Live video of Becky and Nelson's meeting, click here. Nelson graduated high school at the age of 16 as an inductee of the National Honor Society, and is currently majoring in Business Administration at Borough of Manhattan Community College. His goal is to become a business executive. Rebecca is a program coordinator at Jewish Family and Children’s Service in Minneapolis. She and her husband Matt stay busy raising their one-year-old baby boy. Sickle cell disease is an inherited disorder of the red blood cells, with some cells being sickle-shaped rather than disk-shaped. The misshapen cells tend to clump in the blood vessels, causing blockages that cut circulation and deprive organs and tissues of needed oxygen. The condition is extremely painful, and usually causes an early death due to organ damage. Bone marrow/stem cell transplant is the only known cure at this time. Approximately 4.4 million people worldwide and 100,000 Americans suffer from the condition, with highest incidence in the African-American community. Sickle cell confers immunity from malaria and is found in populations around the world where the mosquito-borne parasite is endemic, as well as those whose ancestors came from these regions. 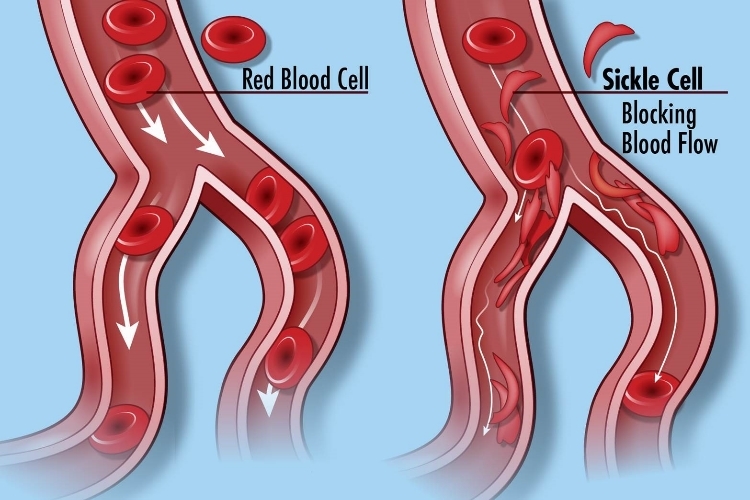 In recent years, doctors discovered that marrow and stem cell transplants can provide a cure for sickle cell disease in more than 85% of patients. Because the best chance of finding a match is with someone who shares the same genetic heritage, Gift of Life is urgently seeking donors of sub-Saharan African ancestry. Our goal is to enable all sickle cell patients who need one to receive a lifesaving transplant. If you are 18 to 45 and in good health, please join the registry by clicking here. To learn more about sickle cell disease, click here to visit Wikepedia's entry.